People in the technology industry often have access to proprietary data and personally identifiable information (PII). It is essential to hire people you feel can be trusted with such sensitive data. Background checks contain facts about a person's past that can be used to make educated hiring decisions. We also recommend annual screenings for people in the technology industry. They show you if anyone incurred new criminal records while under your employ, which helps establish their ongoing eligibility at your firm. The technology industry is fiercely competitive. When hiring people, you must move quickly before they get picked up somewhere else. 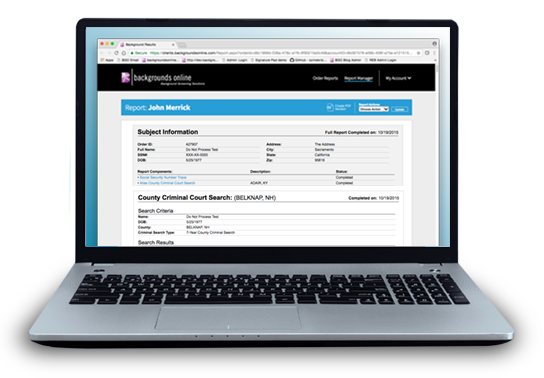 Backgrounds Online provides swift turnaround times for our reports to help ensure you don't lose out on great candidates. We also offer tools that expedite the screening process, such as Applicant Self Submittal and Reference Verifications. Count on us to verify an applicant's identity, check their employment history, search for criminal records and provide the facts you need when searching for new employees. Positions in the technology industry are likely to have specific requirements and qualifications. To help you find eligible applicants, Backgrounds Online offers Custom Background Checks. Start with the basics, like identity verification and criminal searches, and add reports that are relevant to each position. This may include verifying professional licenses, confirming credentials, drug screening or related services. If you would like assistance in putting together a background package, contact us. Technology is an ever-growing industry that advances at a lighting fast pace. Among the biggest challenges facing companies in this industry are employee retention and accelerating the hiring process. When looking for fresh talent, you must move quickly. There are some areas, however, where you cannot cut corners. The most important is making sure you only use FCRA compliant background screening practices. Backgrounds Online is a Consumer Reporting Agency, which means we are authorized to provide fully compliant background check reports. Talk to our screening experts to learn more about what we can do for you. How can a background check help reduce my expenses? A: We think of a background check as a small investment that pays off big over time. They help you make the best possible hiring decisions, thus avoiding the time and expense of ongoing searches and training people who are not qualified for the position. Background checks offer a thorough overview of your applicant. They confirm your candidate's identity, show their education/employment history and verify any required licenses or credentials. They also show you if a candidate has a criminal record. If so, your report will provide information about the offense, conviction and other details you may wish to know. Can you verify licenses and certifications? A: Yes. Backgrounds Online offers a host of verification services. We will confirm whether or not your candidates have the licenses and/or certifications that are required for any position. Will Backgrounds Online call and interview all the references provided by my applicants? A: Yes. We understand that checking references is an essential part of the screening process. This can be especially true in the technology industry. You want to be certain that the people you hire are fully qualified and capable of completing the projects they are assigned. Our expert screeners call each reference and conduct thorough interviews about your candidates, their work history and related topics. Our industry is extremely competitive. How can Backgrounds Online expedite our hiring process? A: We understand the urgency of identifying and hiring qualified people before they accept positions elsewhere, and have various ways to help speed up the process. Our highly trained staff will prioritize Reference Verifications, Employment Verifications and other manual components of the background check. We pride ourselves on providing a fast and thorough turnaround time. We also offer online features such as Applicant Self-Submittal, which allows you to have your applicants provide details to initiate their own background check, thus saving you time and accelerating the process. If you have questions, or would like to speak to one of our screeners about what we can do for you, please contact us. It is essential to do everything possible to make sure your employees are reliable people you can trust with sensitive and propriety data. Backgrounds Online provides comprehensive screening services that help you identify the most qualified individuals.